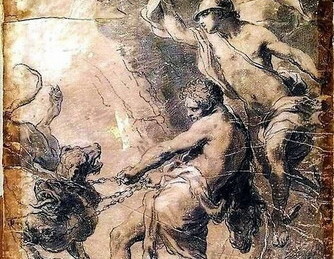 Finishing up the twelve labors, Hercules fights way, way too many things: a giant boar, a giant bull, vicious birds, man-eating horses, the three-headed hell hound Cerberus, and more, all as penance for his crime. The creature of the week are invisible weasel brothers that might give you a small cut or two...or might cut off your legs...all without you feeling it. As much as I enjoy your storytelling, you really offended me by mocking unrealistic scenes. If you had any knowledge about the origins of the myths and symbolism, you would not put them down. Your SJW white knighting with the Amazononians was ignorant. Your insults towards Heracles for being manly just projects your low self-esteem and jealously. You sound like a product of the Progressive American or Canadian school system. I could do without chiptune music. Not all your listeners are Gen X – Z geeks, Read a real mythology book. ha, I missed this the first time. Usually people who use SJW unironically don’t make it past Mulan. I’m surprised they made it so far. I’m new to the podcast and really enjoying it. You wondered during the episode why Demeter and Persephone would withhold the Eleusinian Mysteries from Hercules for killing all of those centaurs, but not all of the men he’d killed previously. This is just speculation on my part, but based on my reading it could have been because they were centaurs. The very earliest writings on Demeter make a close connection between her and horses (which makes sense for a harvest diety) and one of her most prominent epithets was Aganippe the mare. A possible interpretation could include a feeling of connection between a goddess who is both horse and woman* and men who are simultaneously horses. Although I don’t have any textual evidence to back this theory up. *I thought of all this because my archeology professor in college focused her work in Pylos, where they found texts describing an aspect of Demeter as a woman with a horse’s head. been cleansed of the slaughter of the centaurs, he was cleansed by Eumolpus and then initiated. Based on that it sounds like there were two bureaucratic hurdles to overcome: First, the lack of citizenship, and Second, that he had not been cleansed for murdering the centaurs. Not having a better grasp on the functional aspect of Ancient Mediterranean religion I imagine the second one to be somewhat like Catholic confession. Perhaps Hercules had been regularly asking forgiveness for all the human men he killed, but didn’t think to ask about the centaurs until he was told he had to. Oh my. The shade you threw at Hercules made me so happy. Especially the entire Amazon Women part. I listen at work and it was hard not to stand up and clap.